The lovely city of St. Paul, Minnesota is home to the Science Museum of Minnesota, a terrific museum full of science activities for the entire family to enjoy. The large building houses numerous displays and exhibits, and quite a few fossils, including one of the best Triceratops fossils in the world. 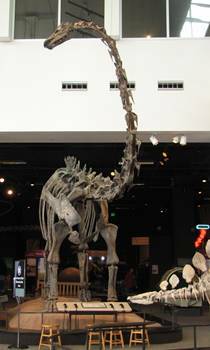 Located on the banks of the Mississippi River in downtown St. Paul, the Science Museum of Minnesota (SMM) offers much more than dinosaur fossils and is really a great combination of a natural history museum, a science museum, and a children’s museum. During our visits, my children have spent more time in exhibits other than the fossils, although that is always our first stop. When you are standing in the large lobby at the Science Museum of Minnesota, don’t forget to look up. Hanging from the ceiling is one of the largest pterosaurs to ever fly in the Cretaceous skies. Quetzalcoatlus had a wingspan approaching 40 feet in length, or just slightly larger than an average WWII fighter jet, and when quadrepedal, it stood as tall as a giraffe. At the SMM, Quetzalcoatlus “flies” far above the lobby and is easy to miss if you don’t look up! After heading upstairs to see the fossil galleries, visitors will first see an interesting hands-on exhibit that is usually quite popular. A large cast of a Tyrannosaurus skull connected to a lever beckons guests to pull the lever and watch the powerful jaws open and close. It’s a fun start to the dinosaur area and never fails to draw my children in. 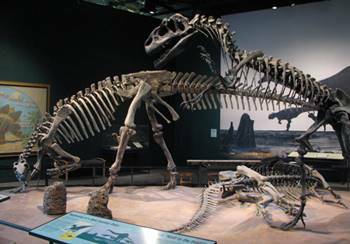 Next on the path through the fossil exhibit is one of the great specimens on display at SMM. 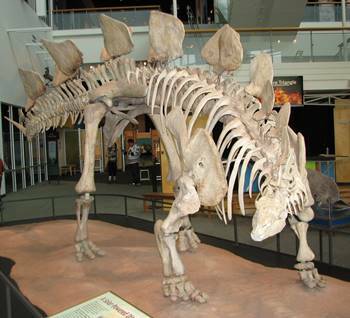 A very large Triceratops stands facing visitors, and it is a remarkable skeleton. 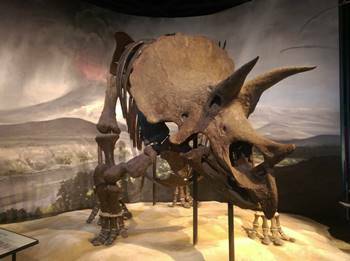 Most museums that display Triceratops mounts show Frankenstein-like composites of several different animals; the one at SMM has bones from two animals but is one of the most complete Triceratops specimens in the world. It is also among the largest, and it is a fantastic mount. Hanging from the ceiling nearby are a Pteranodon and a mosasaur, and the wall between the Triceratops display and the fossil gallery features a large Xiphactinus skeleton. Two very nice mounts greet visitors at the fossil gallery entrance: a beautiful cast of a Stegosaurus and a very large (and tall) Diplodocus. The Diplodocus is roughly 82 feet long and was discovered in Wyoming by a group of Minnesota high school students. The Stegosaurus stands just outside the fossil galleries and is beautifully displayed with the tail up, looking as if it is ready to swing its “thagomizer” at any predator unfortunate enough to get too close. The “thagomizer” is the informal nickname for the tail-spikes on a Stegosaurus, and it has a great story behind it’s name: in 1982, legendary cartoonist Gary Larson in his Far Side comic strip showed a caveman lecturing other cavemen on the Stegosaurus and pointing to the tail-spikes of the creature. “Now this end is called the thagomizer…named after the late Thag Simmons.” The term became popularized later by paleontologists and has been used since to describe this iconic (and lethal) weapon. At SMM, the rest of the dinosaurs on display can be found to the left side of the galleries. A striking scene shows an Allosaurus hunting two Camptosaurus. While the Allosaurus is a good specimen, it is displayed in the outdated tail-dragging pose. In the display, one Camptosaurus has been knocked to the ground while the other tries to fend off the attack. The impressive Camptosaurus at SMM is among the largest I have ever seen and may be the largest yet discovered. In glass cases around the Allosaurus/Camptosaurus scene are numerous dinosaur fossils. Some are bones, others are casts. The cast of the Dilophosaurus skull is a favorite, and an interesting carving of the small theropod dinosaur Compsognathus by SMM paleontologist Bruce Erickson looks remarkably like a fossil skeleton. Other dinosaur skulls occupy the cases, including Camarasaurus. SMM exhibits an interesting collection from the post-dinosaur Cenezoic period. My favorite is a terrific display about ancient crocodiles that lived in warm swamps common to the area during the Paleocene epoch around 55-65 million years ago. There is a beautiful fossil of a Champsosaurus, one of the most successful aquatic reptiles in history. Several species of Champsosaurus have been identified, and this amazing animal resembled a modern fish-eating member of the crocodile family called a gharial, but was not related to it. Champsosaurus survived the Cretaceous extinction event and lived throughout much of the world for another 30 million years or so. The display at SMM is quite dynamic, one of the best Champsosaurus displays I have seen. The Champsosaurus and many other fossils at SMM come from a paleontological site called Wannagan Creek, located in western North Dakota. For many years, SMM has conducted research at the Wannagan Creek site which dates to approximately 60 million years ago–only five or six million years after the dinosaurs became extinct. 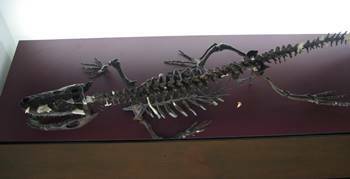 The site exposes fossils from what were a swampy, lowland environment at the time, and several types of reptiles have been recovered. 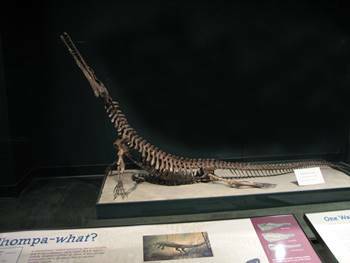 An unusual small alligator-type animal called Wannaganosuchus had a relatively short snout and was probably the third or fourth largest reptile in the area. The fossil at SMM is a beauty. Numerous other fossils from the site are displayed in this area, including turtles and other small animals that have been found there. While the dinosaurs at SMM get most of the attention, the Wannagan Creek site fossils are probably most interesting to paleontologists and show a window into a fascinating time period that most people know very little about. There are other post-dinosaur animals on display at SMM. 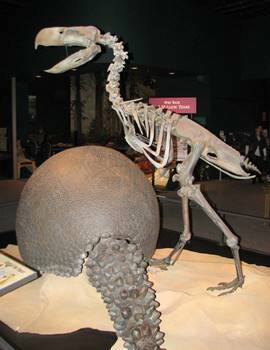 One of my favorites is a cast of the South American “terror bird” Phorusrhacos, a giant carnivorous bird that presumably stalked small mammals and other prey about 16-17 million years ago in Argentina. Large birds like Phorusrhacos also inhabited North America for millions of years, but there is currently a debate about whether or not they were carnivorous. Some North American species exhibit traits that indicate a herbivorous diet, although it is likely that they were more ominivorous, supplementing a diet of seeds and plants with small animals and insects. As for the Phorusrhacos, however, the beak is especially impressive, and it is not hard to imagine it easily striking a lethal blow to a small animal. Unfortunately, these great birds went extinct, possibly due to increased competition from large predators that migrated across land bridges that connected North and South America and led to significant changes in both ecosystems. Yes! There is an awful lot to do at the SMM, and our family has had a great time doing a lot of things here that have nothing to do with the fossil collection. The wonderful Experiment Gallery is full of hands-on science activities that are just as fun as they are educational. The Math Moves area focuses on math, which is also really fun. The museum has great exhibits about Native American history and the Mississippi River, and a large screen Omnitheater which shows IMAX movies on a regular schedule. The Mississippi River flows just outside the museum, and just down the street is the stadium where the NHL’s Minnesota Wild play their hockey games. A short jog brings you to the state capitol building, and there are plenty of shopping and eating destinations nearby. The fossil exhibits are really good at SMM, and there are some great displays. Still, they feel a little sparse possibly because they are spread out over a large area which includes a small stage and seating for science shows. The cafeteria is just past the fossil exhibits, so during the middle of the day there is a constant flow of people coming and going through and past the dinosaurs that aren’t really there to see them, which can be a little distracting. Most of the iconic dinosaurs are easily seen from outside the galleries, and I think a lot of people miss the interesting stories that are told inside, particularly about the Wannagan Creek site fossils. I think more people would take the time to learn about those displays if more of the iconic dinosaurs were further into the galleries to draw guests in. My children love going to the SMM; we have visited three or four times and they have enjoyed it every time we go. While the dinosaurs and fossils are popular with my sons, their favorite activity at the museum is definitely the Experiment Gallery which never fails to hold their interest for a couple hours. There is also a really fun musical stairway; guests can “play” the notes by walking up and down the stairs. The gift shop is also particularly good. Not only is it large, but it has an incredible variety of items. Plan to spend a good four hours or more at SMM, there is a LOT to do, and it is an awful lot of fun.